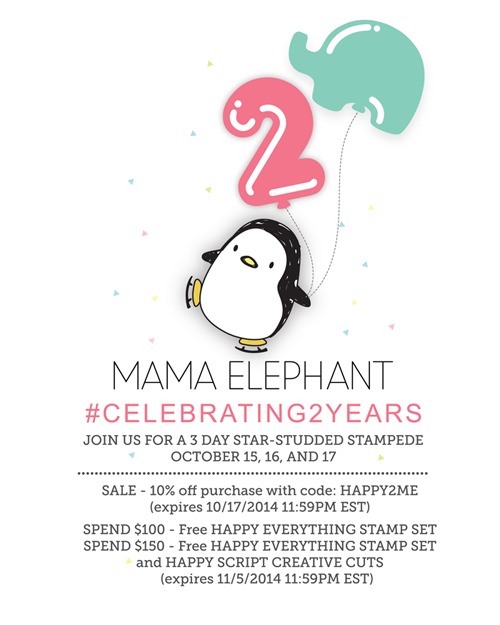 mama elephant | design blog: October Anniversary Stampede - DAY 3! October Anniversary Stampede - DAY 3! Welcome to day 3 of the Mama Elephant Anniversary Release stampede! We have been overwhelmed by all the love and support. We really, really appreciate you embracing our humble designs and products. We are so thrilled to make a small impact in this amazing community. Thank you for allowing us to do that. Our newest anniversary release is now live and available for purchase in the store! This includes 7 new stamp sets, 6 Creative Cuts die sets, and 16 brand new pigment ink colors! All Promotional freebies will be manually added to your order. To qualify for the freebies, your order must total the amount AFTER any discount applied and before shipping/tax fees. While supplies last! Today I'm using the new set Alpine Carolers designed in collaboration with Elena Roussakis. Aren't these carolers just cute and festive?! I also used one of the fantastic greetings from Peace on Earth which was designed in collaboration with Pauline Ibarra. It's a collaboration card kind of day! This is very basic stamping, no fancy tricks or techniques... anyone can do this! Stamp, stamp, stamp and color to your heart's content! Today is the final day of the Stampede, but don't fret we will be giving away THREE $25 gift certificates to our store! Just leave a separate comment for each! Winners will be chosen randomly based on collective comments left on the designers's blogs. So be sure to leave loads of love for everyone! Also, make sure to check us out on Facebook, Twitter and Instagram, because there just might be exclusive giveaways in each too! Now let's get on with the Stampede! Late to the party? Check out day 1 and day 2 of the Stampede! Absolutely love the carolers!! So very cute! Love the card!! That card is darling! Urgh ... I need to get into copic coloring. So cute. They are adorable and I love the big sentiment over them! Love this card! so sweet! Congrats and happy anniversary, Mamas!!! Love this card. I love that scripty font...please, keep adding more of those! Again, congratulations on your Anniversary...here's to many more!!! What a beautiful card! Those Alpine Carolers are the cutest! Very cute card! I love the snowy background. H2B2U, ME! Love the Alpine Carolers...so cute! So, so adorable1 Love this! Love all of your stamps! Happy anniversary! Can't wait to go on this blog hop this afternoon. Love the red peace on earth with the carolers. Happy Celebration! Thanks for the giveaway! Again... beautiful amazing release. Thanks for the great giveaway! Love this card! When you are make Holiday cards the easier to replicate the better!! Thanks for the inspiration! Doing lots of happy dances this week as I see the new release and the fantastic inspiration being provided!!! W.O.W! Congrats! I love all your products are great! congratulations, congratulation, congratulation :))) Love all you do! And the new release is just adorable!!! So cute how the carollers are holding the ornaments between them! I really love that sentiment! It really is a peaceful scene. This card is amazing and sweet!! Great! Loved your sweet card. Those BIG sentiments are wonderful! Thanks for a great blog hop and Congratulations on 2 amazing years. OMG, those children are so cute! Such a sweet card and the New stamp sets are awesome! Can't wait to play with my order when it comes in! I love the style this card has. Just beautifuL! Adorable set and I just love your coloring. Thanks for sharing! I absolutely love the carolers it reminds me of the scene in How the Grinch Stole Christmas, when the town comes out in the morning and gathers around the tree and start singing.. great childhood memories.. thanks so much for creating this set.. it is a must have! Goodness, I love this card! That big, bold sentiment and those cute carolers...just perfect! Very cute card! Love the big sentiment. This card is so cute! Love it! This is such a cute little scene! I'm a huge fan of large sentiments like that! I love this card with the Carolers and the beautiful sentiment!! Adorable!! Love the big sentiment. ME big sentiment has its own style! Very pretty... Love the carolers!! I like you on Facebook...love all of the new sets!! Adorable! lovin' the new release! Loving this new release! It's so hard to choose what to order! I <3 Mama Elephant!!! Love how the kids got colored. Eyeing that sentiment stamp. Awesome card! Love those adorable little carolers and the big festive sentiment!!! I adore this! I love this stamp set and this card looks awesome. Such a sweet card! I love so many of the new releases, thank you for being such a great company with fantastic designs! Love all the inspirations shared by talented designers! Love all the cards and stamps! Ohhhh so adorable the more cards I see with these carolers the more I like that set. Thanks for sharing. So super cute!! Great coloring!! I already LOVE Mama Elephant on Facebook! Happy Anniversary so Happy for you! LOVE ALL of the new designs.....So Fun! Super cute card! Love your coloring and the simple design! What a cute card and cute little family! I already follow ME on FB. I love your cute card---those carolers are so sweet! Super bloghop! New inspiration and great ideas; I have to find some time this weekend and play with stamps and ink!! Thank you so much for bringing us stamps that encourage us to COLOR!! It's such a fun outlet! Just such a sweet stamp set. Love the way you've colored it. Follow you on Twitter, already. Thanks ME for the plethora of ideas using your newest release. All the designers just nailed it. I also want to say your new pigment colors rock! Been a Facebook fan of yours forever. I "like" Mama Elephant on Facebook. This card is beautiful and goes great with the sentiment. I just love these little carolers and the sentiment is perfect with them! My wish list just keeps getting longer! An adorable card :) Love the sweet carolers and the awesome sentiment! The carolers are so sweet and versatile. Love that sentiment, love that card and love ALL of your new releases! Adore the sentiment "font"/script and love this card - hopefully the postie will get here early next week with my carolers set - can't wait to get colouring! It's been a great hop. So many wonderful ideas for my greeting cards. I love everything about this card! The Peace On Earth is pretty! and those carolers are too cute!! These little carrolers are so cute! I love love love this stampset - it is just too cute!! Those absolutely adorable Carolers go perfectly with the Peace On Earth sentiment. What a beautifully simple but impressive card. And I love the coloring too. Soooo pretty. I love that large sentiment. Super sweet card! Love it! Love the children. They just make this card! Very sweet, and your coloring is beautiful! That's such a sweet card. Those little carolers are adorable. Today's hop (stampede) was SO much fun. All of the designers made such delightful cards with your fabulous new release products. I love your card, too - the carolers are SO adorable. Thank you for three days of inspiration. Can't get enough Mama Elephant! Love all your stuff! can't wait for my order to arrive! Sweet little carolers & I really like the colors! Could I say just one more time (today)…I LOVE Mama Elephant inks! And now I found out they blend well (gotta try soon!) and the new colors are just WOW!!! Love those BIG sentiments, too! Thanks, ME! Follow on Facebook and Twitter. Love to win love your stuff!!! Such a lovely card! Love the new inks - must haves! I'm all for making a simple card that looks like it took days to make. Beautiful card! Such a great release- can't wait to try them! Such an adorable card with cute stamps! Sweet card. It reminds me of being in church and everyone holds hands while praying. This is a cute one layer card. So many wonderful things on this release! Absolutely love all the releases. And there is so much talent on all the blogs. Can't wait to start playing! I love, love, love, love this card! Adorable! Love the bright color combo! That little family is just so cute! Love it! This card is adorable! I love the new releases, so cute, I need them all! What a lovely caroling family! Wonderful inspiration today...it was a great hop. Liked you on FB already. Great card. Love the carolers! Fabulous two years wishing you many more to come! LOVE these adorable carolers!! TFS! Great caroler stamps...makes me want to carolling with them. I love these little carolers!! I've just seen the small boy from the Alpine Carolers on Widas blog and realised that somebody needs to make a card with him (or the girl) as if they are making a snow angel - please make this happen!! Wonderful holiday release! Everything is awesome! love that their heads are bowed! Already a fan on FB, but shared! I'm loving the new release! Thanks for the chance to win! Love everything in your release this month! Thank you for all the inspiration too! Such amazing inspiration!! Love the products and projects! Love your collaboration carolers card! I love all of your new stamp sets! So versatile!! Thanks for sharing and Congrats!! May there be many more years to come! What a great card!! I love this stamp set and your making me want it even more!! Lol ;) thanks for the amazing inspiration!! More great inspiration today! Love the coloring on this card. Such a cute card. I just love these alpine carolers and that cute little new penguin stamps. I want them all. Love these little images to color. What a sweet card. I love the sentiment and your coloring. Great card. Your coloring looks awesome too. The carolers are so cute! Great card. What a wonderful card! Your coloring of the carolers is fantastic. I'm a little late to the hop so I've got to go. Thanks. Adorable card! This has been a fun Anniversary Stampede! I love all the creations! Thank you so much for all the chances to win! Happy 2nd Anniversary Mama Elephant! Loving all the creations, such awesome eye candy and inspiration!!! Happy, happy Anniversary!! These carolers are adorable, lovely card today. Cute card! I love the carolers. Such a sweet, simple card. A real delight. Sweet card! Love this release. Oh yes indeedie I ordered the alpine carolers! Can't wait to get them! What an amazing release!! The penguins are by far my favorite! You really have a way with cute critters. Those carolers are adorable! Thanks for the chance! I agree with everyone those carolers are so cute! Adorable--love the carolers holding the ornaments! Fabulous snowy background too! Can't wait to get home and check my mail. I hope my order is in. So excited! Love the card and that big scripty sentiment is just perfect. Liked on Facebook. Loving the new sets and dies. Love the card. I like your new releases - love the new ink pads! They are cute when you put them all holding hands that way. This is an adorable card and I think the new release is filled with all winners. Great job! great releases and great hops! And I'm following on twitter now too! I love today's card. The caroler's stamp set and pease sentiment stamp are fantastic. They are on my wish list! !